Onions may bring tears to your eyes, but the benefits of onions will definitely leave you smiling! Rich in biotin, calcium, Vitamin C, Vitamins B1 and B6, dietary fiber, folic acid, and Vitamin K, onions add flavor to your food and goodness to your body. Ever wondered why your eyes begin to water as you chop onions? Well, they release the enzyme alliinase when cut, in turn causing your eyes to water. The benefits of onions include detoxification of the body and protection from cancer. Here are some of the benefits that you get when you eat an onion is some form, be it raw or added to a tasty dish. Onions are rich in an antioxidant flavonoid called quercetin. A majority of the health benefits of onions can be attributed to this chemical compound. Quercetin thins the blood, reduces cholesterol, increases the levels of HDL cholesterol (good cholesterol), fights blood clots, hay fever, diabetes, atherosclerosis, asthma, chronic bronchitis, and infections. It is especially known to inhibit stomach cancer. This vegetable also has various anti-inflammatory, antibiotic, antiviral properties. To reap these benefits of onions, just eat one medium-sized onion per day, in raw or cooked form. Detoxification is another function associated with onions. This property is due to the sulfur-containing amino acids, methionine, and cysteine present in them. These amino acids help wash away mercury, lead, and cadmium out of the body. Harmful metals like arsenic and cadmium are also flushed away by the Vitamin C present in onions. Onions are highly beneficial to counter heart disease. Half an onion a day is usually enough to dramatically raise HDL cholesterol levels. Onions also counter clots, lower total blood cholesterol, triglycerides, and blood pressure. Improved heart health is also one of the health benefits of onions. The antioxidants present in onions help flush away cancer-causing free radicals from the body. Research shows that onions and other vegetables of the same family contain organosulfur compounds that help prevent cancer. Onions lower blood glucose, which is otherwise the primary function of insulin. This increases the lifespan of insulin. Onions are known to offer some relief to asthmatic patients as they inhibit compounds that result in spasms of the bronchial muscle. They are also effective in fighting bacteria like E. Coli and salmonella. The health benefits of onions are definitely many. 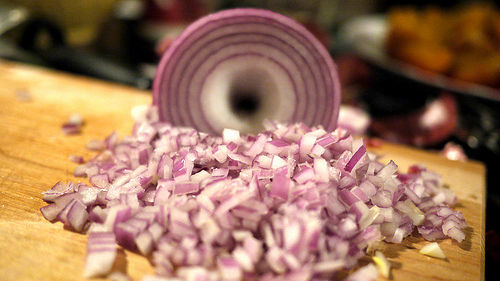 Enjoy your food with small amounts of onions added to it and stay healthy! This entry was posted in Nutrition and tagged benefits of eating onions, health benefits of onions by Zipheal Editorial Staff. Bookmark the permalink.